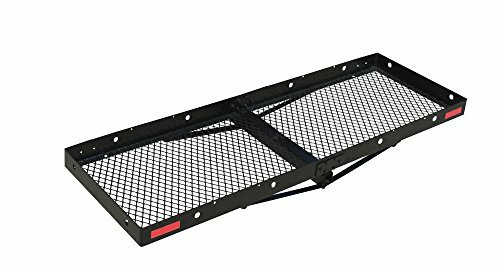 Uriah Products hitch mounted cargo carrier for any 2 inch square hitch receivers features steel construction with a black baked-on powder coating enamel finish. Equipped with a steel mesh bottom to prevent liquid build-up and rust. Carriers up to 500 lbs. of cargo. Has a cargo carrying size of 22 inches by 60 inches with 4 inch high rail and reflectors. If you have any questions about this product by Uriah Products, contact us by completing and submitting the form below. If you are looking for a specif part number, please include it with your message.